RSL national secretary Derek Robson says the fact that it is the 90th anniversary will add a touch more significance to the day’s ceremonies. “It is 90 years since the end of World War I, and the recent ceremonies on the western front and right across France and Belgium are testament to that; it’s a particularly important time for our nation because of our extensive involvement in that area where we had our greatest losses over,” he said. Amongst those who made the journey was Australian Governor-General Quentin Bryce. Ms Bryce was in tears as she laid flowers at a mass grave in honour of those fallen soldiers who were killed in the Battle of Fromelles in 1916.
â€œOne thinks of the blood and the sweat and the tears, the deep sadness for so many families,” she said. The mass grave was discovered earlier this year on the outskirts of Fromelles and holds the bodies of about 400 Australian and British servicemen. The bodies will be exhumed and reburied individually with full military honours in a new cemetery in the town next year. Later today, Ms Bryce will be the guest of French President Nicolas Sarkozy at the Verdun international ceremony marking the end of the Great War. The 400 Australian and British WWI soldiers buried in the mass grave at Fromelles had been missing since the war itself. Their whereabouts were unknown until July of this year, when excavations at the Pheasant Wood battle site confirmed the soldiers were interred in group burial pits. The soldiers’ burial site may never have been discovered had it not been for the years of detective work and campaigning by Melbourne amateur historian Lambis Englezos. Since 2002, Mr Englezos, with a few supporters, has gathered evidence to back his seemingly fanciful claim that aerial photos sourced from the Imperial War Museum showed graves behind German lines in 1916. Over the next few years, Mr Englezos continued to search for evidence proving the existence of these mass graves. He obtained several personal accounts and miscellaneous details including, oddly enough, that the Demassiet family, who own the site, had never been able to grow a decent crop there. By May 2005, Mr Englezos and history enthusiasts John Fielding and Ward Selby, whose father fought at Fromelles, had enough evidence to convince the Australian Army History Unit to convene an expert panel. They got their hearing, but it wasnâ€™t until December 2006 when the expert panel approved a surface probe of the site by battlefield specialist Dr Tony Pollard. When Dr Pollard’s team began work at Pheasant Wood last May, Mr Englezos was there, having paid his own fare. Dr Pollard’s team of six conducted a range of sophisticated tests and trial excavations, which proved that more than 400 bodies were buried underneath the surface. Minister for Defence Personnel Warren Snowden has confirmed that the British and Australian governments have jointly agreed to exhume the soldiers buried at Pheasant Wood and reinter them. 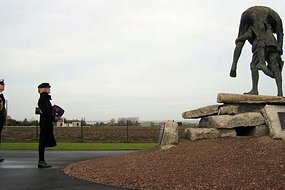 “That will mean that we will seek the agreement of the French authorities and on the basis that we get that agreement, we would hope next summer to be exhuming the remains of those brave soldiers from that fateful day in July of 1916 and have the bodies then reburied in separate graves,” he said. Mr Englezos hopes a DNA data base could be built up in the slim chance of matching remains with living Australians in the long term. “Germans offered the Australian commander McCay the chance of a ceasefire to collect all of our dead – he refused,” Mr Englezos said.